I am the first to roll my eyes at so-called “disaster tourism,” where people visit a place that’s been devastated by a natural disaster, such as New Orleans after Hurricane Katrina, to see and take pictures of the aftermath. Call me an old-fashioned travel rube, but I can’t really get my head around the appeal of going somewhere to ogle carnage. Part of this stance has been influenced by where I live — all summer disaster tourists have been walking or riding their bikes up my sidewalk to gawk at the eroded river bank and our churned up street that almost fell into the Bow River. But I changed my tune when I found out the Inglewood Bird Sanctuary was offering free guided Flood Tours four times a week into October. Before the flood we visited the Bird Sanctuary as a family a couple times each season. We often spotted deer or chickadees, and sometimes a muskrat or great blue heron. I’ve missed the familiar hiking trails and wanted to see for myself how this Inglewood attraction fared during the flood — not to gawk, but to know. Guide Kyle McManas, a member of the education team for the federally-designated wild migratory bird sanctuary, led us from the nature centre (which was unaffected by the flood) on a paved path toward the lagoon. There we stopped and looked at the debris-clogged main bridge while McManas described the impact of the flood on the sanctuary’s infrastructure and animals. 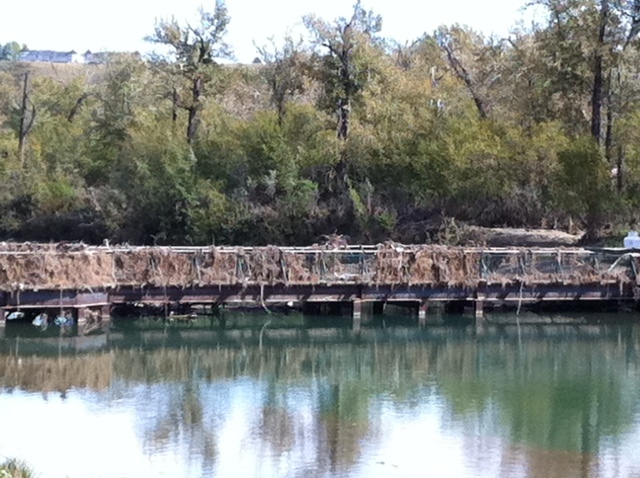 The large logs have been removed, but this bridge is still clogged with detritus. At its highest, the river flowed through the sanctuary over top of the bridges (washing one away completely) and all the paths — save the high gravel trail running between the lagoon entry point and Colonel Walker House — at an estimated flow rate of 2,200 cubic metres per second, three times the flow of the 2005 flood that also flooded the lagoon. When the water receded it left a mess — plant debris and layers of silt. Park staff were encouraged to see wildlife return to the area immediately, including deer, beavers, ducks, kingfishers and even porcupines. As McManas explained, though dramatic, floods are a regular (if sporadic) occurrence in a riparian environment. 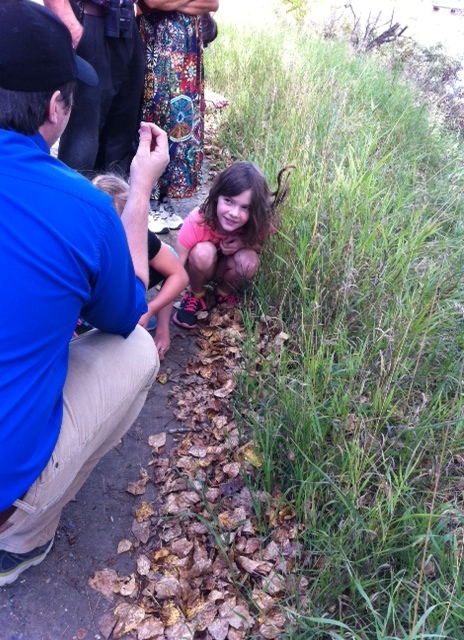 Avery examines a layer of silt that runs along the edge of the trail, proof the water ran that high. While it’s what nature does from time to time, it’s still not nice to see how much the Inglewood Bird Sanctuary has to do to rebuild. Though work has already begun on the trails, the planned re-opening isn’t until summer 2014. This coming weekend, Sept. 28 and 29, you can visit the Inglewood Bird Sanctuary and Colonel Walker House, which will be open between 10 a.m. and 4 p.m. both days as part of Doors Open YYC. Interestingly, Colonel Walker House was originally built much closer to the Bow River, but a flood in 1882, and then another one in 1897, destroyed the first two attempts. The current brick house sits much higher, but its basement still flooded in June. 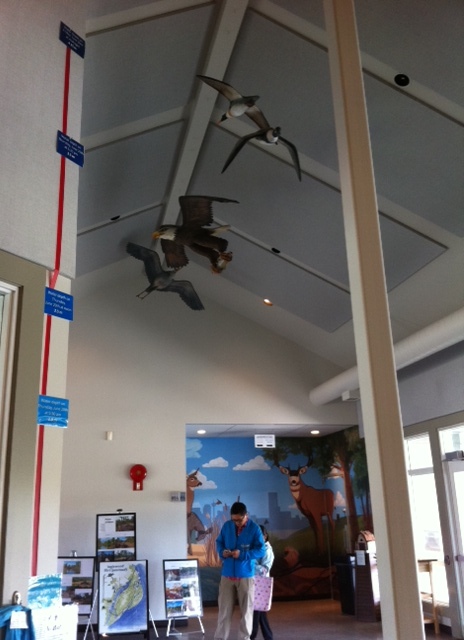 The nature centre is also open daily from 10 a.m. to 4 p.m., but closes on Mondays starting in October. Flood tours run Tues., Wed., Thurs. and Sun. at 1:30 p.m. through Oct. 10 and can be booked online. So, have I become a disaster tourist? Hardly. It was actually a relief to see the bird sanctuary — I was expecting a lot more devastation (I’m sure it looks a lot better now than it did on June 25, the day the workers were allowed back in). Still, they have a lot of work ahead of them and I’m hopeful we’ll be able to resume our regular walks there soon. 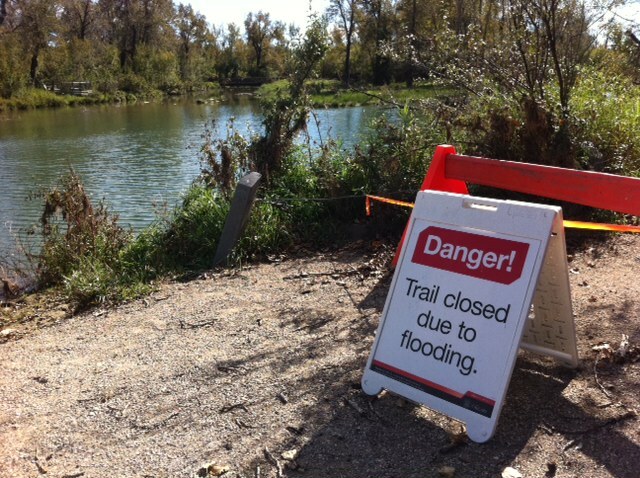 A diagram inside the nature centre at the Inglewood Bird Sanctuary illustrates how high the Bow River ran before it crested at midnight on June 21 — 4.1 metres, up from about 2 metres at 9 a.m. on June 20. 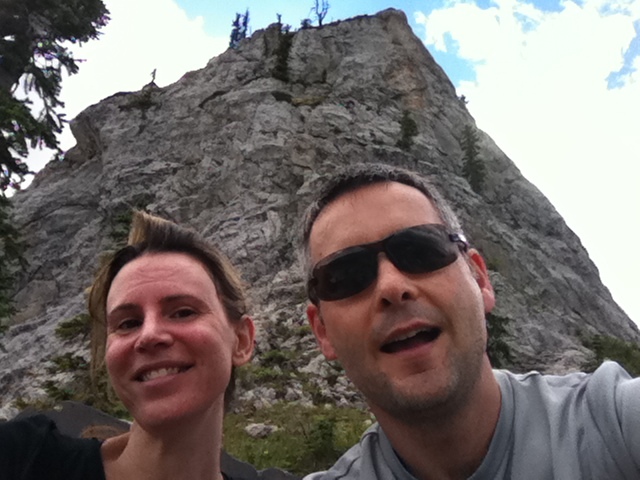 We go to Fernie a lot in the summer and have spent the past several years exploring the many hiking trails in the area. A favourite place to go has been Island Lake, a beautiful mountain lake located up a winding dirt road that travels through Mt. Fernie Provincial Park. We usually just walk around the lake with the kids — or canoe on it — but this summer we had the opportunity to leave the children in Fernie with Grammie and spend a night at Island Lake Lodge to celebrate our anniversary (16 years!). This meant we could graduate beyond the lake trail to the more difficult ascents above timberline. Taking a rest on Spineback Trail. 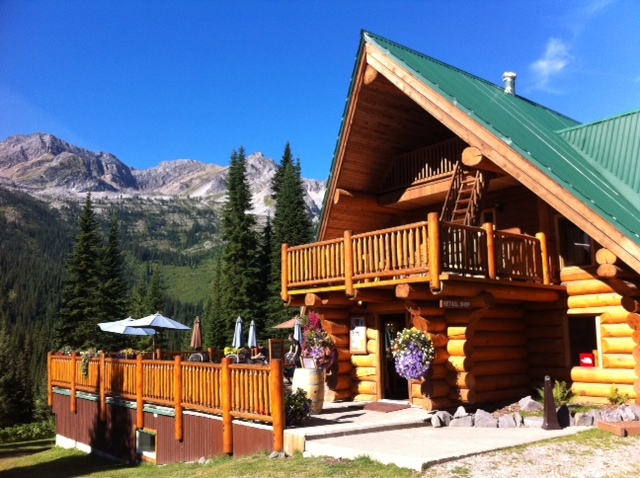 The lodge is best known as a cat-skiing base during the winter, when feet of epic Fernie powder fall on the slopes that surround the lake like an amphitheatre. Come summer the area transforms into a beautiful mountain sanctuary, with old growth cedar forests giving way to sub-alpine meadows dotted with wildflowers and rocky escarpments inhabited by marmots and pikas. We opted for Spineback Trail, a hike that climbs 530 metres over 3.5 kilometres up a ridge. The payoff? It’s a great workout and there’s a lovely wooden bench at the trail’s terminus that affords an eagle’s eye view of Island Lake and the lodge far below. 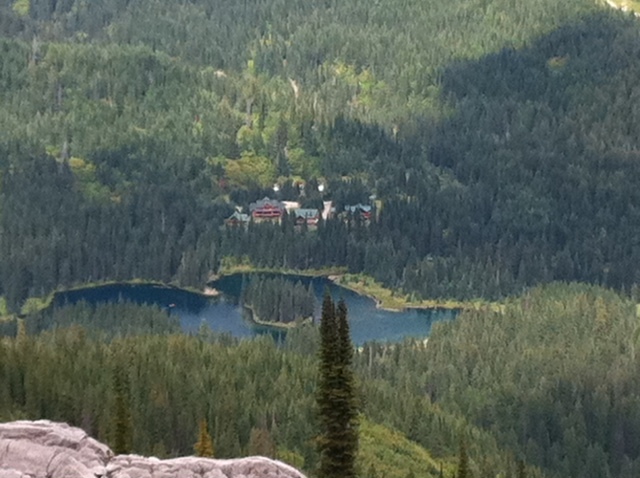 Look down, waaaay down: Island Lake and Island Lake Lodge as seen from the top of Spineback Trail near Fernie, B.C..
We boogied back in a short but insistent rain storm and headed straight for the hot tub to help us warm up and rejuvenate our over-tired muscles. Then it was time for a rich dinner of duck, lobster, creme brûlée and lots of wine, served in the main lodge. The mountain air afforded us a sleep in (kid-free, hooray!) and we emerged for a buffet breakfast and a short hike around the lake. There wasn’t a lot of time to luxuriate in our cozy room in Cedar Lodge (complete with balcony and mountain view), but the point of an escape to Island Lake is to get active in a breathtakingly beautiful place. What a great way to spend our anniversary — doing something we love, together, in the mountains. We’ll be back! A beautiful summer morning at Island Lake. Billed as a “Stampede for geeks” the Beakerhead festival is running in Calgary through Sunday, Sept. 15. Events across the city, such as today’s Sustainival — a “green” carnival featuring rides powered on renewable energy — celebrate art, science and engineering. This year, part of the festivities include Engineered Eats, a series of special dishes at seven local restaurants that show off the latest food trend: molecular gastronomy (that’s industry-speak for getting scientifically fancy with food). Because cocktail culture in Calgary keeps growing, bartenders at those restos have gotten their geek on too, by coming up with engineered cocktails to complement the eats. 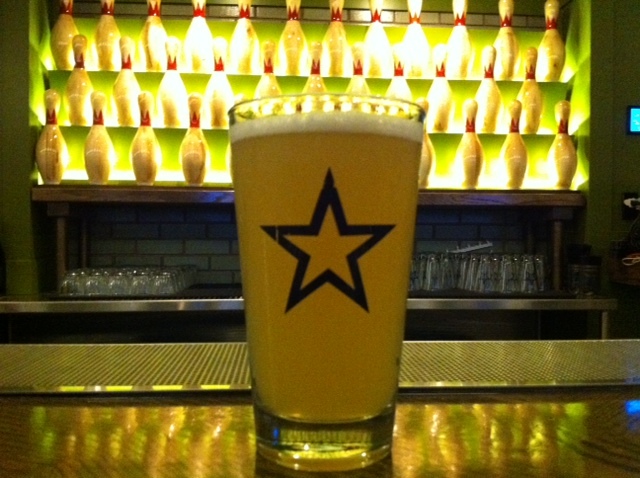 I attended an Engineered Eats sneak preview earlier this week and was impressed by the creativity of local mixologists. 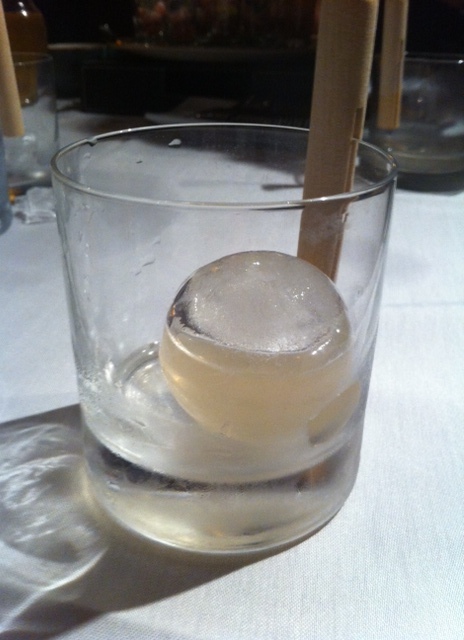 This kaffir-coconut shot comes in a sphere of ice that you crack open with a mallet. Event host Muse showed its inventiveness by re-imagining my favourite childhood refreshment, the push-pop. The Kensington restaurant slushified a tequila sunrise, added a pinch of cayenne and some sous-vide fruit gel, then devised a way for the resulting mass to become spicier as you pushed it to the top of the somewhat leaky push-pop device. CHARCUT created a cognac Manhattan and topped it with a vanilla-apple foam. And Raw Bar raised the bar on presentation by injecting its delicious kaffir-coconut-cinnamon concoction into a perfectly round sphere of ice. It was a little confusing as to how I was supposed to drink it until bartender Christina Mah handed me a little mallet with which to crack it open. A bag of lemons and a container of basil make lovely bedfellows when they find themselves in the drink with a bottle of Victoria Gin. The resulting love child is called a basil gin smash. This twist on a classic smash is an aromatic end-of-summer sipper. But good luck just sipping it. Traditionally, a smash is a short cocktail with a base spirit, sugar, perhaps a touch of lemon or lime, ice and mint. Sometimes a liqueur is used in place of sugar syrup, or a grapefruit gets juiced rather than a lemon. But there is always mint. Unless, of course, you use basil. 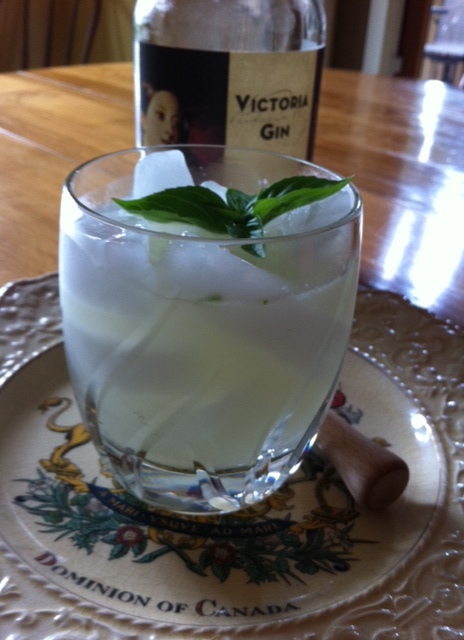 I prefer basil with gin as it plays nicely with the spirit’s botanicals and I sometimes find mint too overpowering. Once in the glass the drink performs as a smash ought to; as in, you’ll become what you’re drinking after a couple (ahem, smashed) because they are so good you will chugalug instead of just sipping. Oops. Add basil leaves, simple syrup and lemon juice to a cocktail shaker. Gently muddle until the basil is fragrant. Add gin and some ice cubes and shake. 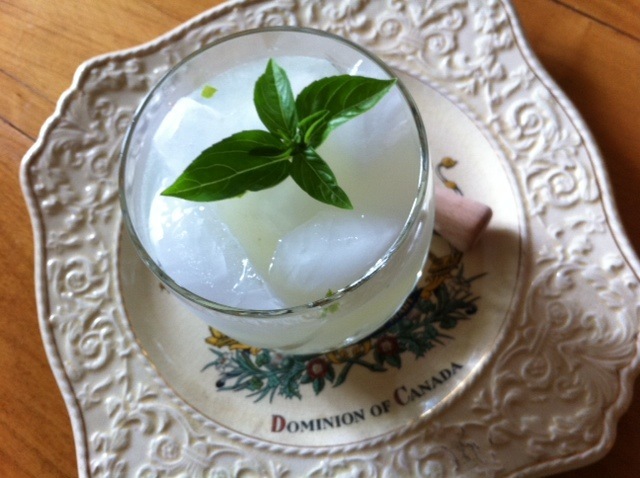 Strain into an ice-filled lowball glass and garnish with the basil sprig. This dink is lovely with Victoria Gin. Yesterday was the first day of school and I’m not gonna lie — I couldn’t push my kids out the door fast enough. Don’t get me wrong. I love the sweet darlings, and we had a great summer of hiking, swimming, road tripping and summer day camping. But after 10 weeks (yes, 10 — the Calgary flood robbed us of four whole days of school) of no structure, “Mommy, watch this!” and bedtimes pushed past 9 p.m., this mommy was ready for a return to sweet routine. 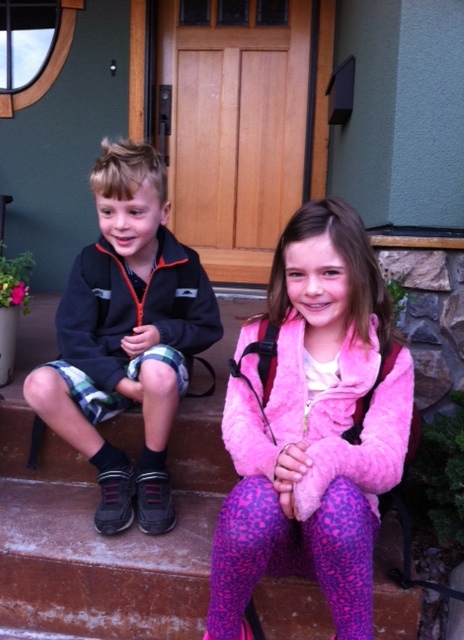 Bennett and Avery were super excited about their first day of school. I was especially excited because this year Bennett is in grade 1 at Renfrew. Translation: full days. I load him on the bus at 8 a.m. and usher him back into the house at 4:30 p.m. I half expect him to head for the Dad chair, ask for the evening paper and order a Manhattan, but today he only said, “I’m hungry,” before devouring a Larabar and a peach. 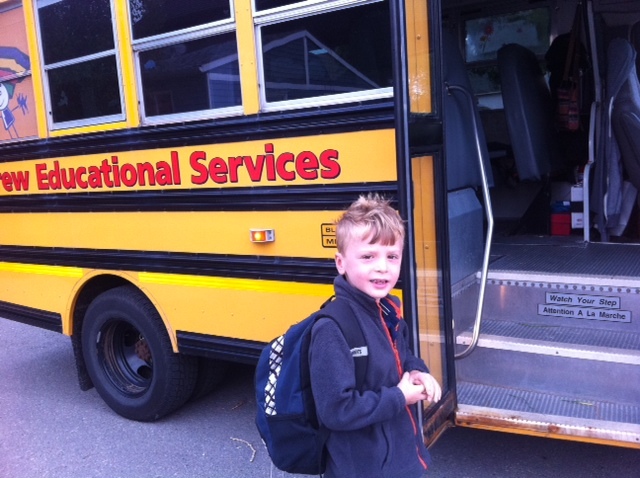 Bennett boards his bus all smiles on the first day of school. Full days aren’t new for Avery, so she barely waved goodbye before lining up by the school door with the other grade 3 kids. 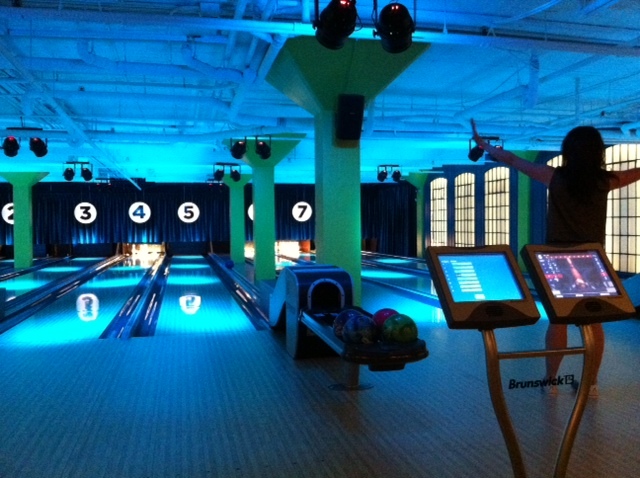 As soon as she entered the building I skipped back home whistling Zip-A-Dee-Doo-Dah. Then I locked the dog into her kennel, popped the cork on a bottle of Moet and cheersed myself repeatedly. 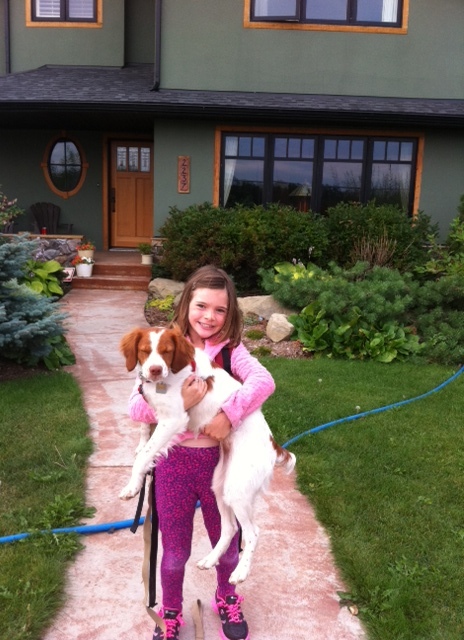 Piper is growing up even faster than Avery! Is it wrong to feel so euphoric about the children entering this new phase of full day institutionalization? Should I feel sad they are getting bigger and growing up? That there’s less time for free play with them, and more time for me-play? Translation: I can actually compose an e-mail without interruption, and I have long swaths of time for writing stories. Some of the moms at Avery’s school have mixed emotions about their kids starting full days. They’re giddy about the new freedom while simultaneously grieving the loss of the littleness. And I get it. During particularly sweet moments I often wish I could just freeze time. I think, “I want them to be eight and five forever!” But then they grow and learn more and I’m glad for it because it means we can do more as a family and have better conversations and it just makes life easier for everyone. What’s more, my kids love school. They are as ready to return as I am for them to go back. As I wrote in a previous post, being a parent is, at its core, an act of letting go.